Is one of your goals for 2015 to get on track when it comes to your finances? If it is, or if you are just interested in saving some money (who isn’t? ), then continue reading this post. I believe that everyone can save money. There is probably something that you are spending money on that you don’t exactly have to. Not everyone wants to work more or make extra money, so cutting your budget may be your only choice. 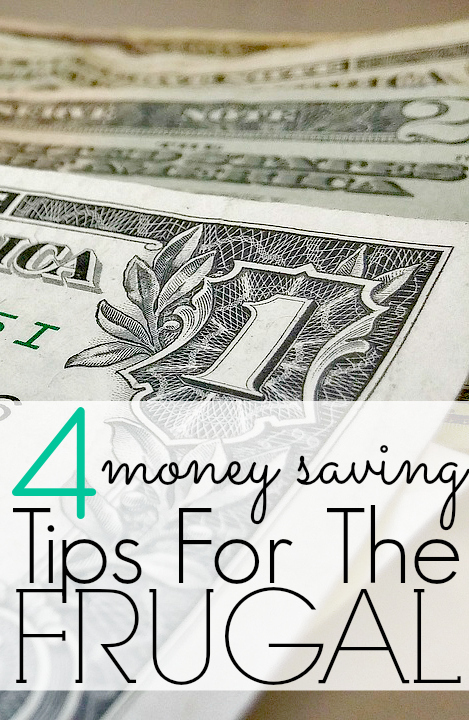 Here are my four money saving tips for the frugal, or the wannabe frugal. 1. Examine your food spending. My first money saving tip is to analyze your food spending. Food spending is a major culprit for why people go into debt and have out of control spending. I know this because it has happened to me. You should closely track your food spending for at least one month to see where your problem is so that you can start saving money in this area. 2. Cut back on entertainment spending. My second money saving tip is to cut back on your spending on entertainment. Entertainment spending can sometimes be the major budget killer for a family’s finances. This is because it can quickly get out of control, and also because most people do not track their entertainment spending closely which means that you can end up spending much more than what you originally thought you would. Seek out free events and festivals in your area. Look for free museum and national park days. Get outside in order to have some fun. Go to a restaurant during lunch or during happy hour. 3. Money saving tip – Lower your heat. It’s definitely winter where I live, and I am sure it is where you live as well. It can be cold outside, but that doesn’t mean you need to crank your heat all the way up and live in a toaster. Try turning your heat down just a few degrees. Put on some pants, a comfy sweater, and some knitted socks and cozy up on the couch. Just by turning your heat down a few degrees, you can probably save some money each month. 4. Search for coupons and promo codes before you buy anything. What I love about online shopping is that I can find a coupon and/or promo code for almost anything that I plan on buying. There are also awesome online rebates companies that you can pair with coupons and promo codes and actually make money off of your purchases. Who doesn’t want that? How are you saving money currently? What money saving tips do you have?